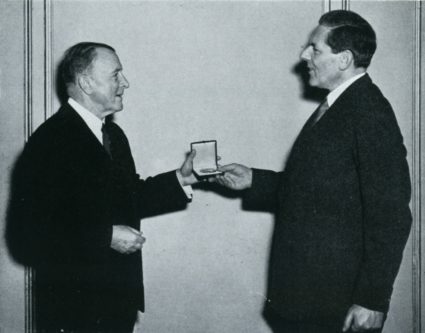 …only twelve medals have been awarded since the first was given in 1936, with recipients including Isamu Noguchi, Claes Oldenburg and Coosje van Bruggen, and Mark di Suvero. 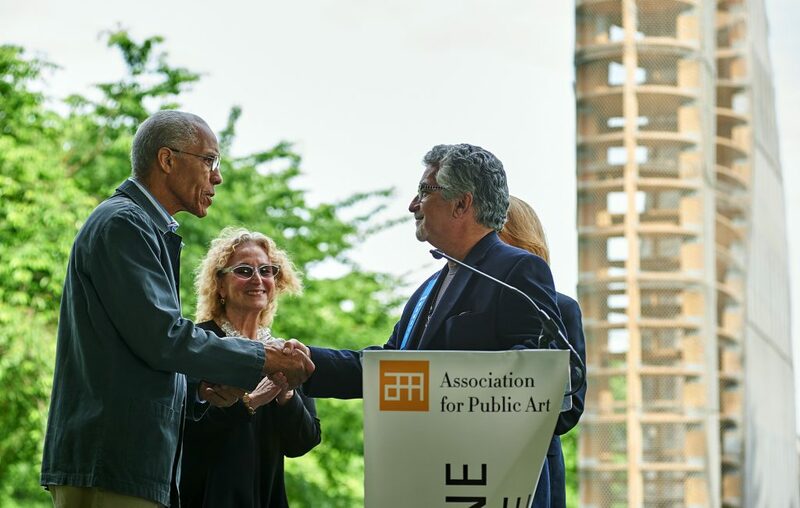 Martin Puryear (left), with aPA Executive Director Penny Balkin Bach (center) in front of his newly-installed Big Bling sculpture on Philadelphia’s Kelly Drive, receives the Medal of Honor from aPA board member Alan Greenberger (right) at the Association for Public Art’s 145th Annual Meeting in 2017. Photo by Albert Yee. The front and back of the Medal of Honor, a small bronze piece designed by artist Walker Hancock. The Association for Public Art’s former name, the Fairmount Park Art Association, is seen on the back. The medal itself – a palm-sized round bronze – is a noteworthy piece. It was designed in 1926 by sculptor Walker Kirtland Hancock, who many know as the artist behind the Pennsylvania Railroad Memorial – the towering sculpture of Archangel Michael lifting a lifeless soldier in his arms at Philadelphia’s 30th Street Station. Other works by Hancock in Philadelphia include Air (1982) along the Schuylkill River Trail and John Paul Jones (1957) in the William M. Reilly Memorial. 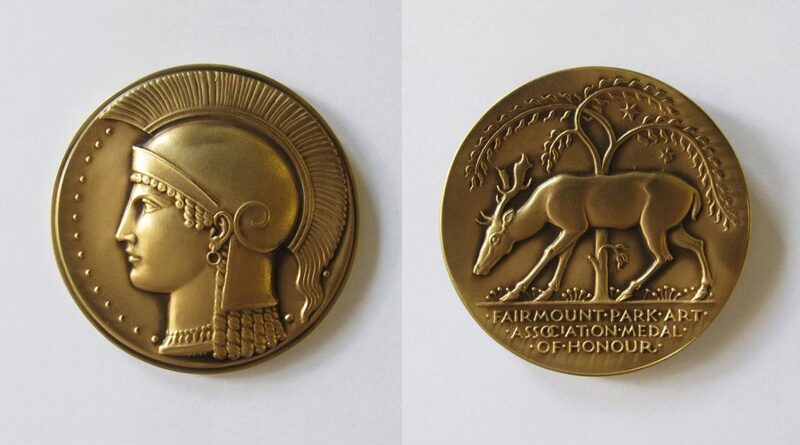 On the back of the Medal of Honor is aPA’s former name, the Fairmount Park Art Association, which was changed to the Association for Public Art in 2012. Martin Puryear is an internationally renowned American artist known for creating sculpture that combines modernist abstraction with the traditions of crafts and woodworking. In Philadelphia, his Pavilion in the Trees continues to be a favorite destination to relax and contemplate nature, and Big Bling, his largest public work to date, is on view through November 2017. 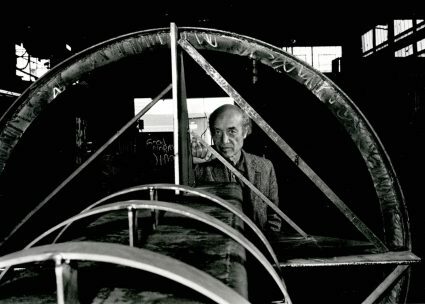 David Pincus (1926-2011) was an art patron, humanitarian, philanthropist, and Trustee of aPA for 40 years. He gifted Mark di Suvero’s Iroquois and Barbara Hepworth’s Rock Form (Porthcurno) to aPA, and Claus Oldenburg’s Giant Three-Way Plug to the Philadelphia Museum of Art. 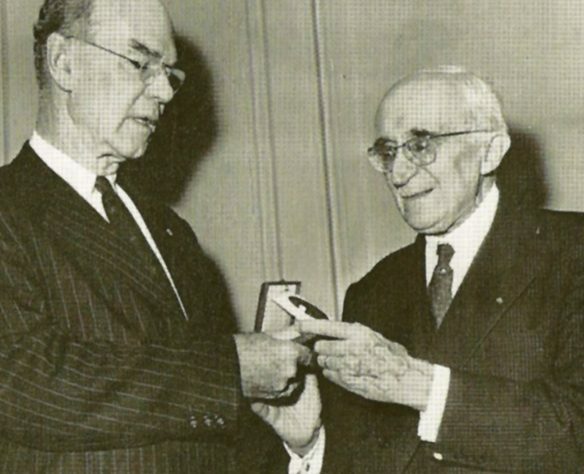 He was awarded the Medal of Honor in celebration of his extraordinary contributions to the public environment of Philadelphia. 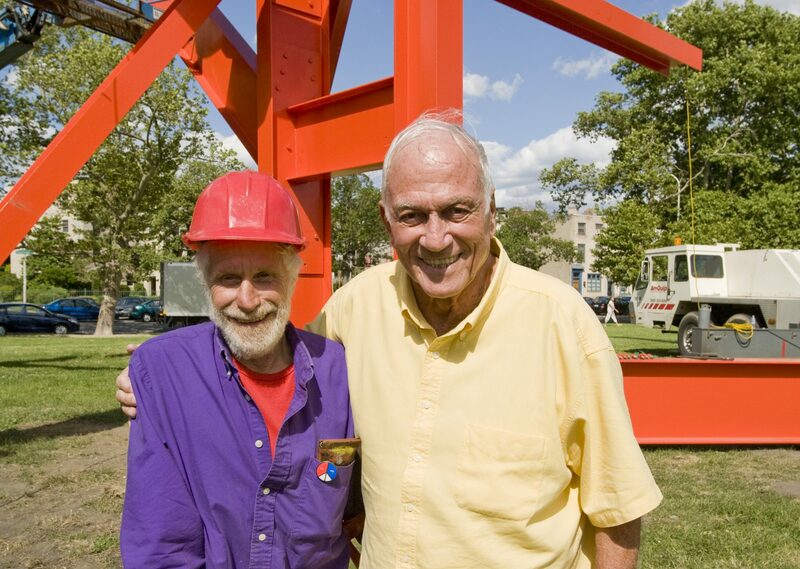 Mark Di Suvero is considered one of the foremost abstract sculptors living and working today. An innovator in the use of industrial materials, he describes his monumental sculptures as “paintings in three dimensions with the crane as my paintbrush.” The aPA installed his Iroquois sculpture in Philadelphia in 2007. When di Suvero was awarded his medal, he spoke to the crowd about art and politics and urged them to celebrate beauty and speak out against abuses of power. 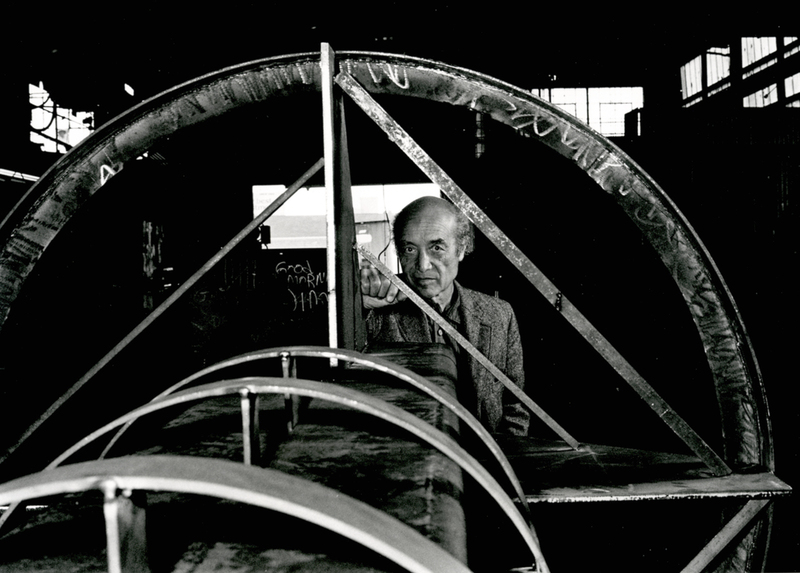 One of the 20th century’s most eminent artists, Isamu Noguchi (1904-1988) was a Japanese American sculptor, designer, architect, and craftsman who created gardens, fountains, sculptures, and other public works for cities around the world. His work is often seen as a merging of Eastern and Western ideas. At the dedication of his Bolt of Lightning sculpture in Philadelphia – an aPA project – he was awarded the Medal of Honor in recognition of his lifelong achievement and commitment to public art. Francis Henry Taylor (1903–1957) was a distinguished American curator and museum director who served as Director of the Metropolitan Museum of Art for fifteen years. He was also Director of The Worcester Museum and Curator of the Medieval Department at the Philadelphia Museum of Art. The Association for Public Art, working with New York’s Madison Square Park Conservancy in a first-time collaboration, brought internationally acclaimed artist Martin Puryear’s Big Bling to Philadelphia as a temporary installation on Kelly Drive. Facing City Hall tower with its sculpture of William Penn, Clothespin has the jolting and humorous effect of a familiar object seen out of context. The 58-ton Bolt of Lightning refers to the famous experiment in which Franklin flew a kite in an electrical storm. Commissioned to honor the Pennsylvania Railroad employees who died in World War II, Walker Hancock’s heroic bronze presents the Archangel Michael, angel of the Resurrection, lifting a lifeless soldier in his arms.